Hull will not use the money generated by the Premier League's new television rights deal to cut ticket prices, says City owner Assem Allam. The £5.14bn deal signed on Tuesday is 71% more than the last contract and Hull, who got £60m from the current deal, will get an increase on that. "The only way to reduce prices is to create more fans by increasing capacity," Allam told BBC Sportsweek. "But you need money to build the stadium - 10,000 seats will cost £20m." Allam took over the club in 2010, saving them from administration, but put it up for sale last year in a row over the name. 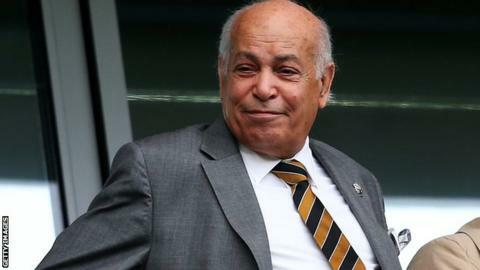 The 75-year-old Egyptian-born businessman, who says he is 'not a football fan but a community fan', wants to change the name to Hull Tigers and after his proposal was rejected by the Football Association Council, he has appealed the decision back to the FA. Hull's KC Stadium has a capacity of 25,586 with an average gate this season of 23,117 and adult match-day ticket prices range from £16 - the second cheapest in the Premier League - up to £50. But Allam says all clubs should look at improving facilities and promoting club academies with the money they get under the new Premier League deal. "If you have 23,000 happily paying what they pay now, to reduce it you are not helping others," he added. "We need to expand stadiums to give more fans and families the chance to come and watch."